Long-term workouts give you "in the bone" and are looking for a way to improve things? Put on an energy gel that will provide a solid dose of energy in a short time. The vitamin C supplement reduces the feeling of fatigue and strengthens the immune system! The highest quality formulation created for the most demanding! Sensational gel training with the addition of caffeine, which allows you ensure a solid boost of energy! Excellent source of carbohydrates during intense workouts. Top-quality preparation with the addition of the patented Vitargo. The original flavor! Modern lean conditioner energy in the form of freeze gel enriched with specially selected amino acids - glycine and taurine. Highest quality! 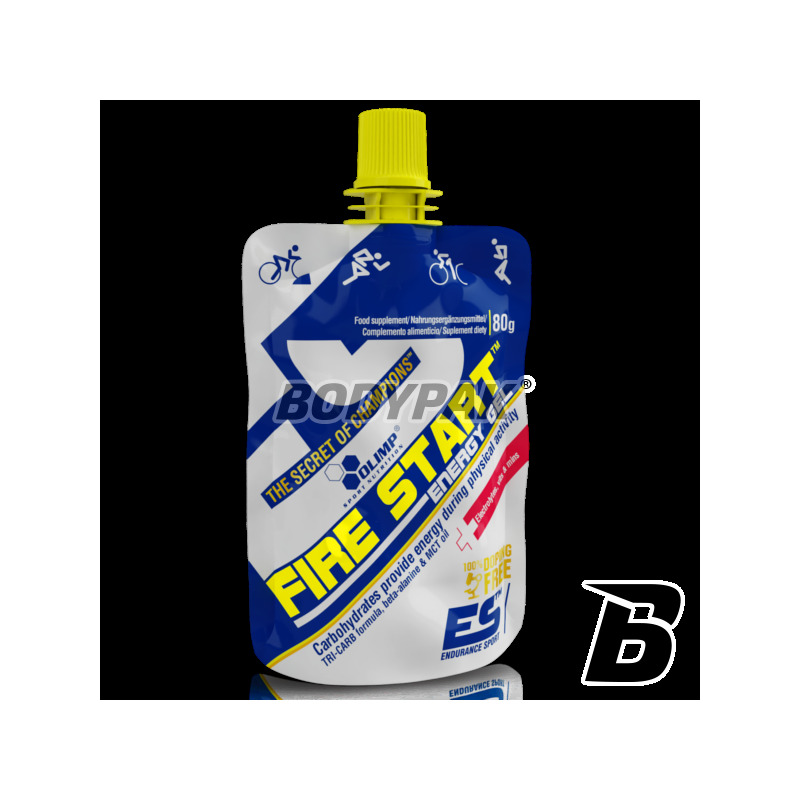 Fire Home Energy Gel - is a product for use before prolonged exercise. In addition to 45 g of carbohydrates from a variety of sources comprises five inter alia MCT oil. 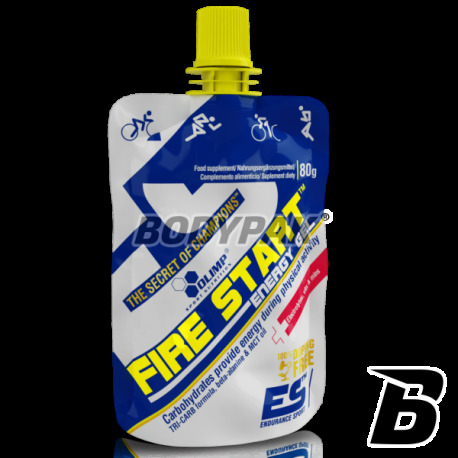 The addition of beta-alanine and caffeine makes the Fire Start is the perfect gel to apply before the start. 6 loyalty points Your cart will total 6 points that can be converted into a voucher of 0,24 PLN. - Muscle glycogen, which provides the greatest amount during the highly intensive efforts lasting no longer, however, as tens of minutes. - Hepatic glycogen, which is the primary source of glucose for long-term efforts of moderate intensity. Glycogen stores are gradually depleted with time progress of the training. When the duration of exercise, performed at low intensity begins to significantly lengthen, as the main source of energy for working muscles take over the free fatty acids, derived from the decomposition of body fat. - Oil MCT - ultraskoncentrowana form of energy, providing 2 x more energy than the same amount of carbohydrates. Triglycerides of medium chain fatty acids, which, after absorption from the gastrointestinal tract would be much more rapidly utilized by working the muscles (than normal fats having a chain length), a substrate for the production of energy in oxygen. - Beta-Alanine - one of the basic substance counteracting the lowering of the pH pathways, which may reduce the efficiency of formation of ATP, and by the ability of the exercise. - Glucuronolactone - participates in the detoxification of the body, thus acting synergistically with beta-alanine. - Kofeina- increases conduction velocity in the nervous system and muscle contraction strength, at a much lower frequency excitation, also reduces the use of glycogen reserves in the body, but enhances the rate of fatty acid mobilization from adipose tissue. UWAGA - kopiowanie oraz rozpowszechnianie opisów produktów zamieszczonych w sklepie BODYPAK.PL jest zabronione! nie wyobrażam sobie biegania z innym żelem. testowałam wszystkie - ten zdecydowanie wymiata! Zawsze ładuję w trakcie maratonu mtb, nie zamula i daje dużo energii. Bardzo fajnie sprawdził się przed maratonem! 1 osób uznało tą opinię za pomocną. High energy gel training in an interesting taste and thoughtful composition! Convenient and hygienic supplementation. An ideal choice for people practicing sports strength or endurance-strength! Professional gel, the composition actually improves the efficiency of the athlete's body! Additional advantages are: good taste and convenient form of sachets. Posta on high-quality products and enjoy the results! A modern application of the gel after exhaustive exercise. Its formula strengthens the regenerative capacity of the body, thus significantly improve your gains in muscle mass and strength. Unprecedented formula! Use high quality complex supplements to provide all required vitamins and minerals. Only best bioavailability and scientifically proven composition. High quality meal additions, meal replacements and healthy, high protein snacks for people who have no time to prepare their meals or wants to avoid boringness of their diets. All kinds of supplements which provide good well-being and healthy. They can be used for improvement of sleep, digestion, immunity, bones and joints condition and many other. Type your email address and get discount now. We use cookie files for statistics, to provide advertisments and website services. Cookies are stored in your device's memory unless you change your device's settings.